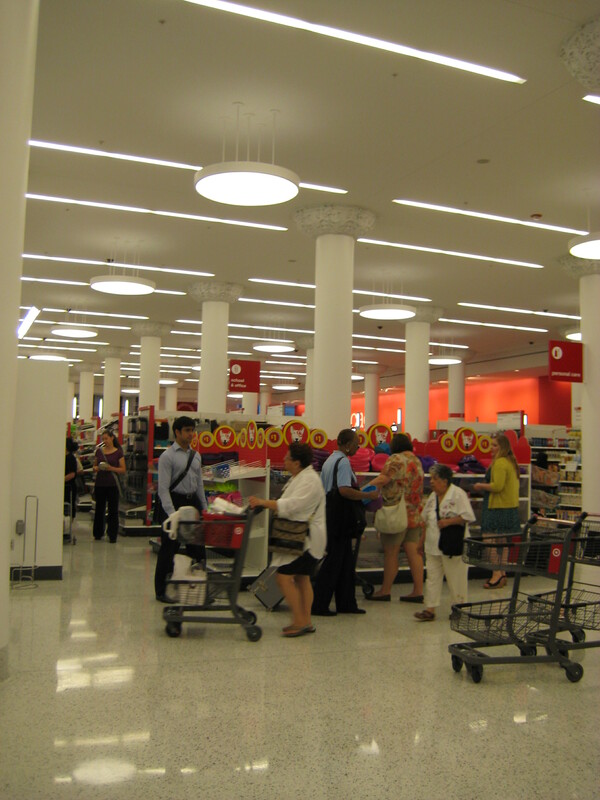 The new Target store on State Street officially opened on Sunday July 29, 2012 in downtown Chicago. 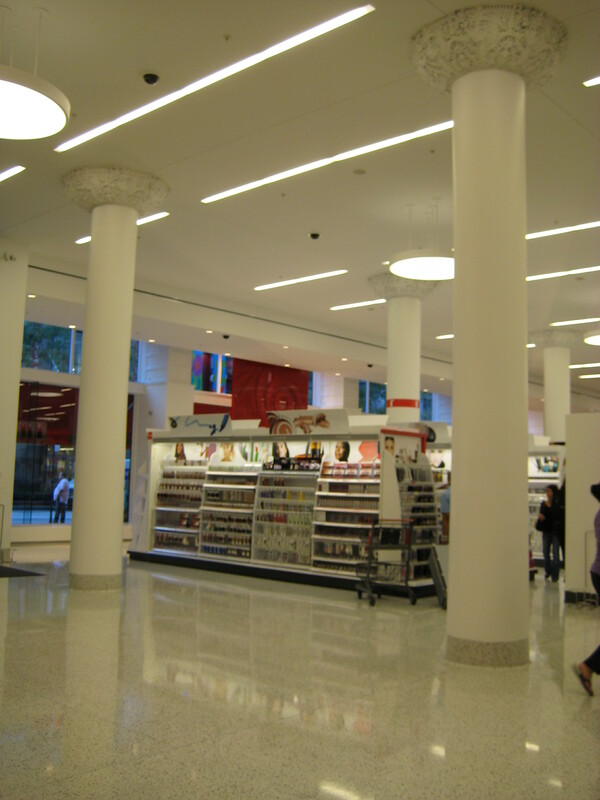 It’s a prime location close to the old Carson Pirie Scott building at State and Madison. This Target is called a City Target. It’s smaller than suburban Target stores (but still has two vast floors! ), and it is designed to be a one-stop shop for commuters and nearby residents. Food and household supplies will be replenished more quickly than at traditional Target stores. Ten percent of the store will have fresh food. There’s also a special cosmetics department and free WiFi access for shoppers. The tall pillars with crown mouldings near the front of the store and a wee Pret A Manger for some small eats. I found it pretty classy for a Target. Very impressive. This store didn’t look like the well worn Target store in American suburbs that we are used too. There was a classier air to this location. I found the store to be nicely laid out, organized and extremely spacious. On the flip side…it’s hard to find stuff. Yes, indeed this is a super store and some items are a bit pricey. But if you are looking for convenience when it comes to groceries and picking up bits and pieces to carry you through on holiday and to bring home for friends and family as economical and practical gifts – this is the Target to go to. 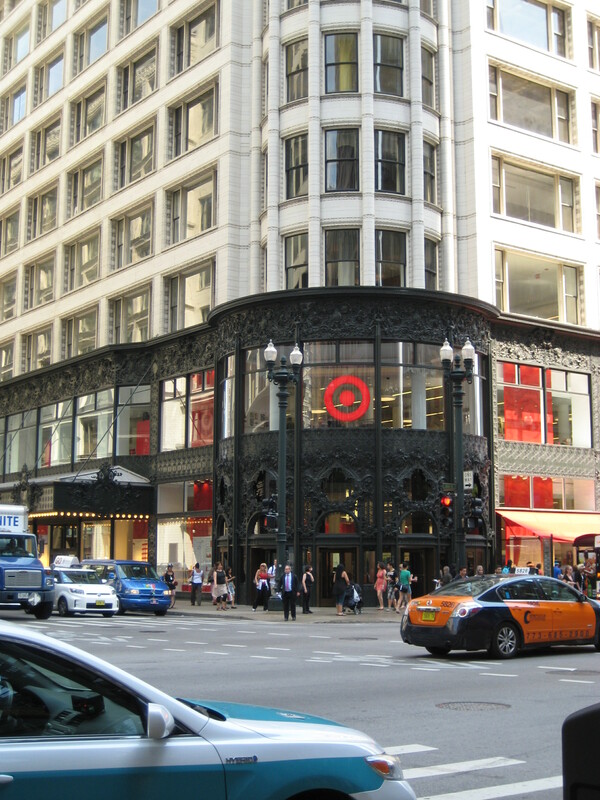 This entry was posted in Uncategorized and tagged chicago tourism, design, Fashion, Ill.), shopping, style, target, Target at State and Madison (Chicago, target chicago on August 12, 2012 by thirtyfourflavours.